Automate your 1) saving, 2) contributions, and 3) those tax claims you seldom hear about – in less than 15 minutes. It's ridiculously easy with the only fund purposely built for the self-employed community. When you’re self-employed, traditional funds slam you with all sorts of complicated forms and painful procedures. You’ve been doing the best you can with a structure created for the old decade. But the times...they are a changin’. Think no more confusion. No more clunky workarounds. Just an easy, 3 step action plan that effortlessly gets you on top of your super. In less than 15 minutes you’ll have everything running on autopilot. And you’ll be relieved you’re doing it right. You get two accounts: Saver and Super. Hook up the Saver account to your bank and start stashing money away without locking it up in super. Tell us how much you’d always like available in your Saver account (for dipping into, in case you need it). Then, once a quarter, we’ll transfer everything over that amount into your Super account. Stop paying more tax than you need to. Automate your tax deduction claims and we’ll give you all the receipts to hand over to your accountant at tax time. Before you, generations of self-employed folks worked too hard for too long, only to get their retirement wrong. They paid too much tax because they didn’t claim their contributions properly. They didn’t stash enough money away. And they grappled with a system that wasn’t built for them. We refuse to let this self-employed generation risk getting it wrong, too. Which is why we combined the best parts of employee super with our smart technology, to give you a savvy super engine created exclusively for you. Meet the family, friends, and self-employed colleagues whose personal stories are helping design GigSuper. "Yes - at last! Somebody that understands the struggle of working for yourself. I like that GigSuper simplifies the process, removing the roadblocks of conventional super. Why hasn’t anyone thought of this before?!" "As a member of the gig economy it would be extremely beneficial to have a super fund that recognises the sporadic nature of my income." "Every year my accountant tells me I should be putting money into super to help minimise my tax, but I never get around to sorting it out. If only someone would make it easy." "It's easy to ignore super because it feels like traditional super funds are built for employees who get their 9.5% automatically paid by their employer without thinking about it. If someone made it easy, just like all the other apps on my phone, I would definitely do it." We won’t kill the vibe with legacy paper-based processes. 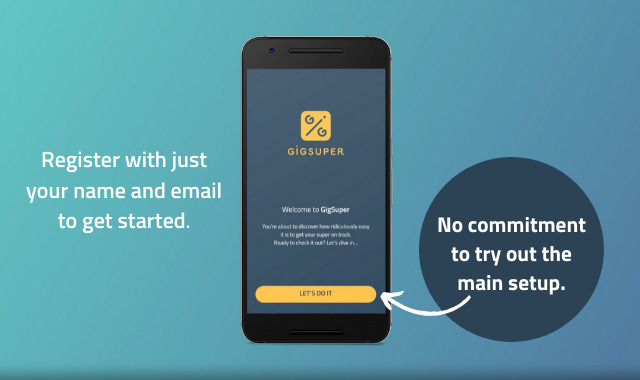 GigSuper is an app-first financial services provider, meaning you approach super the way you approach work - on your own terms, at your convenience. What do tax deductions have to do with superannuation? When your employer puts money in your super, it gets taxed at 15%. When you’re self-employed and you personally put money into super, you’ll need to pay tax in your own name on that money, at your marginal tax rate (which is 34.5% for the average self-employed Australian). However, if you want that money to get taxed at 15% instead of your marginal rate – you need to claim your contribution as a tax deduction. Traditionally this involves sending paperwork to the fund, but with GigSuper you can automate the process, helping you reduce your paperwork and your tax bill. If this is a super fund, how come I get a Saver account too? You might currently have a savings account you’re using to save for a holiday, or a new car, or perhaps even a deposit for a home. Our Saver account is not for those things. Instead, think of the Saver account we give you (coupled with the Super account) as your retirement bucket. The reason you get the Saver account is because we know that establishing regular savings for super can sometimes be tricky when you’re self-employed if your income varies. So we make it easy with a dedicated Saver account that’s designed exclusively to save for your retirement, without immediately locking that money away in super. If you need to, you can access the money in your Saver anytime. OK, I’m in! How do I roll over my current super? Once you’re in, we’ll also help you find any other super you have out there – including super you might have lost track of over the years. And you’ll be able to roll it all over with a couple of taps. Just make sure you consider any potential loss of existing insurance or other benefits you might have with your existing fund(s) before you consolidate your super. What are your investments like? You know how the Barefoot Investor and Warren Buffett are always praising index funds*? All the investment options in GigSuper are built using index funds. This means you won’t be paying fund managers unnecessarily hefty fees to try to outperform the market...because in the long run, that’s an extremely difficult task to pull off. Find out more here. Is GigSuper for all self-employed people? GigSuper is ideal for all sorts of sole traders, freelancers, consultants, tradies, drivers and riders, creatives, independent contractors, small business people, coaches, side-hustlers, influencers...and the guy you hire to put your IKEA stuff together.